HP Umpire Tripp Gibson ejected White Sox Pitching Coach Don Cooper (ball four call) in the bottom of the 7th inning of the White Sox-Angels game. With one out and the bases loaded, Angels batter Luis Valbuena took four consecutive pitches from White Sox pitcher Dan Jennings for called balls. Replays indicate all four pitches to Valbuena, including the decisive fourth ball located off the outer edge of home plate (px -1.01, pz 2.00), and all eligible pitches during the preceding Albert Pujols at-bat (which also resulted in a walk), were located outside of the strike zone or within borderline territory as specified by UEFL Rules 6-2-b-1, the "unrealistic outcome" clause of 6-2-b-3 (closest px value was -.759), and contributory pitch provision of Rule 6-5-c-5-d, the call was correct. At the time of the ejection, the Angels were leading, 4-2. The Angels ultimately won the contest, 7-6, in 11 innings. This is Tripp Gibson (73)'s first ejection of the 2017 MLB regular season. Tripp Gibson now has 6 points in the UEFL Standings (2 Previous + 2 MLB + 2 Correct Call = 6). *UEFL Rule 6-2-b-3: "In the event of a called ball four, in an at bat that has lasted no more than four pitches, including the called ball four, the four called balls shall be adjudged to have been correctly ruled, provided that the Pitch f/x chart for the at bat does not include any pitch within the bounds of the strike zone. Borderline pitches in a four-pitch walk at bat shall be deemed as having been correctly called, due to the unrealistic chance of an alternative outcome." This is the 36th ejection report of 2017. This is Chicago-AL's 2nd ejection of 2017, T-1st in the AL Central (CWS, MIN 2; DET 1; CLE, KC 0). This is Don Cooper's first ejection since August 10, 2016 (Pat Hoberg; QOC = Y [Balls/Strikes]). This is Tripp Gibson's first ejection since June 6, 2016 (Joe Maddon; QOC = N [Check Swing]). 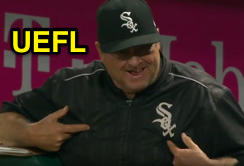 Wrap: Chicago White Sox vs. Los Angeles Angels of Anaheim, 5/16/17 | Video via "Read More"